You might think this is unlikely since you’re not using skill to make decisions on which cards to hold; however, things could go wrong and cost you money. Open Door: This is a frequent occurrence, especially if the person playing before you was banging on the device in frustration. If it happens before the next game, then just wait for an attendant since the light will be flashing. If it happens in the middle of a game, especially a bonus round, then just stop and wait. Make no attempt to close the door yourself because if it causes you to lose the bonus then you won’t be able to recover your loss. Recently a woman was playing China Shores in a Maryland casino and received 480 free games. She chose to play the games instead of taking the money (if you select the money you receive an amount with a given maximum and minimum; over time the two options are the same but definitely not for this given bonus). After the first few games the machine malfunctioned with a door open message and all of the games disappeared. The lady called a mechanic who closed the door and the games returned to the screen. In this case the slot supervisor was called and she told the player to choose the cash since the amounts were always the same, an untrue statement. The player refused and ended up winning over $6,800 after several multi-game re-triggers. This was significantly more than the indicated maximum payout had she done what the supervisor instructed. In this case, she was very lucky that she stopped playing, had the games restored and refused to do what the employee, who probably didn’t want to wait while she played all the games, told her to do. Low on Paper: If you see a light flashing on your machine it usually means it’s low on paper. Ask an attendant to check the machine and if it needs paper it will be done quickly. Otherwise you may be out of paper when you try to print your ticket and will have to wait for an attendant and usually a hand pay as well. Defective Touch Screen: This can happen on a slot machine or the ticket redemption device. If it’s on the slot it’s usually during a bonus round and you should call an attendant immediately rather than pound on the device or hit every button in frustration. Unfortunately, this process may take a long time so once everything is resolved I would find another machine. You may be told the problem has been fixed but that’s rarely the case. That’s because management doesn’t like to disable machines, especially during peak times and sometimes the problem requires a higher-level tech to fix. If it’s a problem with the ticket redemption kiosk, then don’t panic or leave the device. Wait for help. Defective Buttons: If you have to pound on sticky buttons then it’s not much fun; also, you can literally jam and injure your fingers in the process. If you’re on a machine with bad buttons during a tournament it’s an absolute disadvantage and, if you had to pay an entry fee, I would request a different machine. If it’s a free slot tournament, you’ll just have to grin and bear it. Un-intentional Bet: Sometimes you’re eligible for the big jackpots without a maximum bet and choose to play less. If you accidentally push the “max bet” button, then don’t bother calling anyone because there’s no remedy. That’s why you should occasionally check since it’s easy to do if you’ve been playing a long time and distracted or just talking to other players. 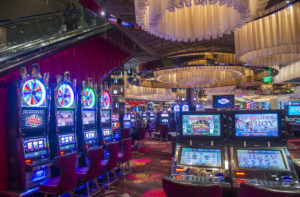 If you look on casino slot machines you’ll see the sign that “Malfunctions Void All Pays And Plays” so the house really doesn’t have to pay you when there’s a mechanical issue. They also realize that you can’t recover your bet so technically it may invalidate the pay but not the play. So if your machine malfunctions stay calm and call an attendant immediately and be both polite and reasonable. In the next issue of Gaming & Destinations I’ll give tips for malfunctioning video poker devices.